Black and white image a young boy with a burlap bag full of potatoes. Empty bags hang from his belt behind him, and the wooden frame which holds the bag open as the worker fills it hangs from his belt in front. He wears jeans, shoes, and a striped, short-sleeve shirt. Filled bags of potatoes dot the bare field behind him. These bags were traditionally suspended between the workers legs, with the worker bending over at the waist to fill the bag as it drags along the ground with each step. 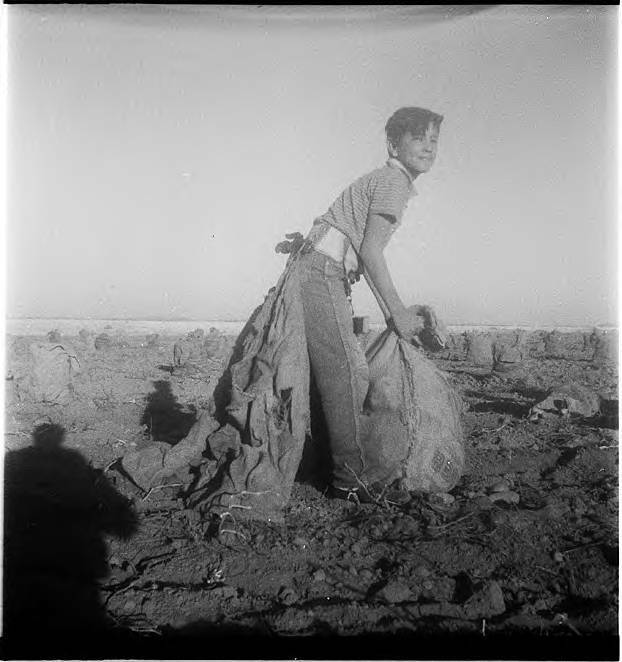 Museum records identify the boy in the image as a 'potato picker,' and he is most likely a migrant worker. Migrant farm labor has been an important part of agriculture in Washington County since the early 1900s, though the cultural groups which provide the majority of the laborers have changed over time.